In Rg Veda Mandala 9 Hymn 74 which I described in the last blog, I talked about massless Goldstone bosons as ‘Go’ or ‘Cattle’ without elaborating on how they are connected to Soma or strong force and how do I end up in that mapping. The sloka is set post the Electro-weak symmetry breaking epoch. Soma, the strong force is born as infant in repeated abundance in high energy electromagnetic rays (Gamma) of the dawn. The stalk holding this Soma is amzu (gluons). This great discharge condenses into a Yaksa (Color Flux Tube) giving rise to wiser beings (newer particles). The soma is milked from the navel of the extremely virtual (Atman), is born as immortal nectar (amrta). It tends to stream away beneficial real particles From its Innumerous streaming, the third division/generation of particles manifests passionate off-springs.The dawn placed downwards from four navels (four fundamental forces); the oblations carry the soma as immortal oil/ghee. The Universe was a high energy electromagnetic radiation filled ‘casket’ or ‘Cloud’ in which a quark soup was manifesting due to soma or strong foce. The third generation of quarks, antiquarks and the gluons were in a ‘de-confined’ state. The verses till 06 talk about this state. It is at this time the chiral symmetry breaks forming hadrons with goldstone bosons as the pions. Verses from 06 to 09 talk about it. In the early Universe, post the electroweak symmetry breaking epoch, Universe becomes filled with high energy electromagnetic radiation and soup of elementary particles called Quark-Gluon-Plasma. This early Universe of High energy electromagnetic radiation with Quark-gluon-plasma can be depicted as the ‘sacrificial oblation’ on which Universe evolves. It can also be depicted as the ‘field’ in which the particle forest and living beings grow. This High energy EM radiation present in this stage of Universe is called ‘Asva’. It is the ‘sacrifice’ or ‘Yajna’ of this ‘Asva’ or ‘High energy EM radiation’ that results in the entire Universal evolution from basic particles of Quarks and leptons to more complex forms like baryons, mesons, atoms, elements, compounds and living beings. In the later days this ‘Universal evolution being the sacrifice of Asva/High energy Electromagnetic radiation’ got interpreted as ‘Universal evolution being the sacrifice of the Asva/Horse‘. Since Asva is applied to those that move fast, Asva got applied to the Horse. Universe was seen as a sacrifice or ‘Yajna’ of the ‘Asva’ or ‘Horse’. This Universal evolution as a sacrifice of the ‘Horse’ is depicted in Brhadharanyaka Upanishad. Will provide a detailed explanation of the above later.. This High-Energy field Universe filled with radiation and quark-gluon-plasma(Asva), can also be modelled as a ‘field’ in which a ‘forest’ or ‘vana’ of complex baryons, mesons, atomic nuclei, atoms, elements, compounds, molecules and living beings grow. The virtual photons are the ‘Apa’ (the Celestial waters) that drives the growth of this ‘vana’ or ‘forest’ of Universe. Without virtual photons, Apa, the celestial water, nothing in this Universe grows. This High energy field of early Universe ( Asva) is similar to an agricultural field with soil. The soil at first is in balance. To sow seeds, the top of the soil needs to be broken or turned over. It needs to be ploughed. Similarly the High energy field Universe post the inflationary epoch is in a balanced state called ‘Symmetry’. The symmetries need to be broken up spontaneously or explicitly. This breaking of symmetry is similar to breaking the top soil or turning over the soil. As the soil breaking leads to better conditions for seeds to grow, the symmetry breaking leads to growth of newer particles and elements in the Universe. These symmetry breakings are called ‘Rishis’. More about different Rishis and Symmetry breakings later. When a ‘symmetry’ is broken, it is similar to the ‘top soil’ in the ‘field’ of High energy (Asva) being broken down or turned over through ploughing a land. This act of ‘ploughing’ on the ‘High energy’ radiation filled field of Universe is in a way, the symmetry breaking as defined in Quantum physics. Quantum physics states that whenever a generic continuous symmetry is spontaneously broken, then necessarily new massless (or light, if the symmetry is not exact) scalar particles appear in the spectrum of possible excitations. There is one scalar particle—called a Nambu–Goldstone boson—for each generator of the symmetry that is broken. The appearance of Goldstone bosons in the High energy photonic field symbolize that the High energy field of Universe has been ‘ploughed up’ or the symmetry has been broken up. Once this high energy photonic field is ploughed up, that is once the symmetry is broken, the high energy field is ready to grow the Quarks and leptons into a forest or Vana of baryons, mesons, atoms, elements, compounds and living beings. Kavandham means a ‘Cloud’ or a pot-bellied casket. The Universe was a kavandam filled with Apa (Celestial waters or virtual photons) and some ‘nara’ (real particles). In other words it was an Asva, a High energy electromagnetic radiation with a quark soup. This cloud of photons or Kavandham was burst. It was burst when soma the strong force forms 'white-colored' or neutral-color-charged matter (baryons and mesons). Downwards/Below that white Kalasam (the body of 'WHITE' mesons and baryons) characterized by various types of Ga/Cows (goldstone bosons), the ploughers of those gamma rays (of photons), eclipsing conquerors. The matter controlling manas (virtual pions) incites/rises from the broken internal symmetry generators of 100's of cold dark goldstone bosons. The white photonic casket is smeared with the ‘Go’ or goldstone bosons which 'plough' the high energy gamma rays in the casket. That matter controlling manas (pions) incites or rises from this broken symmetry generators of 100's of cold goldstone bosons. Kaksivat is a Rishi. A Rishi is a symmetry breaker. Kaksivat is the Explicit symmetry breaking that happens post chiral symmetry breaking due to masses of quarks. Those/that essence of fluid/watery strong force mingling (with manas or virtual particles), flows through the filtering cover as pAvaMana (purified or filtered one). The intelligent beings (atomic nucleus) that forms clean off (the excess soma) as they soak in soma as they become considerate for Indra/baryons to drink pavamana. The virtual pions or the manas filter the soma or strong force and send it out as pavamAna, the purified one. Intelligent atomic nucleus (with higher and higher number of nucleons) clean off the soma or strong force as they soak in soma as Indra (baryons) drink the pavaMana, the filtered strong force or residual strong force or nuclear force. So when filtered Soma or strong force, the residual strong force is drunk off by the Indra or baryons to form nucleons, the Soma or strong force becomes wiped off, as it gets limited to baryonic distances. Kabhandam is a pot-belly barrel or cloud or a headless trunk. 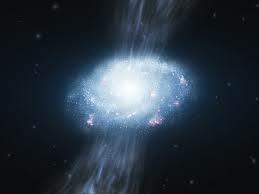 Universe was a kabandham of high energy electromagnetic radiation. It was 'asva'. But when 'Go' or Cows or goldstone bosons that characterize symmetry breaking appear in it, it becomes 'Kalasam'. Pions are mesons and are the 'Varuna'. Kalasam is also a pot, but one with Varuna or Mesons in it. Invoking Varuna (pions) on the pot of Photons (Kabandham) and white-colored matter (neutral-color-charged matter) makes it a 'Kalazam'. In fact all pots of water where Varuna is invoked are kalasam. The white water photonic casket (zvetam kalazam) smeared (aktam) with the ‘Go’ (gobhir), the high energy EM field (A vAjy) ploughs/furrows (kArSmann) conquering it (sasavAn). The matter controlled by the manas (manasA devayanta) incites/rises (hinvire) from the broken the symmetry (kakSivate) of 100’s of (zata) colder (himAya) goldstone bosons (gonAm). The water (adbhih) of Soma (the pions) blends with (papRcAnasya) these (te) (as) essence (raso), (as) the filtering/straining (avya) cover (vAram) of the soma, making the pavamAna flow (dhAvati). The Soma wipers (mRjyamAna) are more ‘intelligent’ beings (kavibhir), masses (tama) that are inert (madin), when pleasant (svadasva) Indra drinks (pitaye) that pavamAna.